OSAP applications can take six weeks or more to process, so don’t leave it to the last minute! 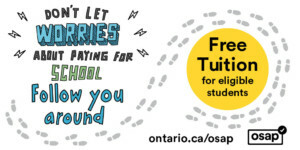 Ontario residents can apply for financial assistance through the Ontario Student Assistance Program (OSAP). 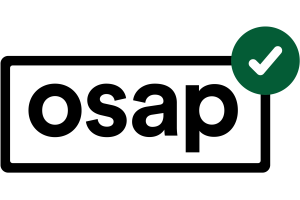 By filling out one OSAP application, you can have access to a large number of OSAP grants and loans depending on your status and circumstances. 1. Create an OSAP account. Go to the OSAP website, select the Register icon and create an account. You'll be issued an OSAP access number and password. Be sure to note this information in a safe place so you can view and check on the progress of your application at another time. You don't need to wait to be accepted into a program before applying for OSAP. To allow enough time for the Ministry to process your application, apply as soon as the online OSAP application is available. Please allow six to eight weeks for your application to be processed. 2. Log in and follow the steps outlined in the online application form. All information is saved automatically and will not be lost. You can cancel your application at any time. The application is submitted only after you've had a chance to review your information and click on Submit. 3. Fill out and return your paperwork. You can obtain most of the documents by printing them from the OSAP website. If you submit the documents on or before the deadline, you'll automatically be granted a grace period for paying your University of Ottawa tuition fees. You, your guardian or partner, if applicable, must sign the signature pages. You must upload your signature pages and all of your supporting documentation (like your proof of marital status, marriage certificate, proof of immigration or refugee status, proof of dependent children, proof of disability, academic progress letter) through the OSAP website. If there are any inaccuracies or missing information, we will contact you. Generally, this process can take from four to eight weeks. Log into your OSAP online account. In the Action column, click Print/Upload. Before the end of July, new OSAP recipients are required to complete a process to sign and submit the Master Student Financial Aid Agreement, which is a lifetime student loan agreement sponsored by the National Student Loan Service Centre (NSLSC). If you are required to submit an MSFAA, it will be listed on the Required documents page of your online OSAP account, under Required documents (print/upload). Two business days after you submit your online OSAP application, OSAP will post your MSFAA number and the MSFAA website address in your OSAP account. Simultaneously, the NSLSC will send you an email to welcome you and request that you register for an NSLSC online account and complete your MSFAA process online. You will need the MSFAA number posted in your OSAP account to complete the MSFAA process on the NSLSC website. Once you have applied and submitted all supporting documentation, it’s important to keep a close eye on your application. Check your OSAP Message Centre and university email account often for important messages. Funding is available for both full-time and part-time post-secondary students. To be considered for the full-time student assistance program (Full-time OSAP), you must be taking 60% or more of a full course load. For undergraduate students, this means a minimum course load of 9 credits per term. For graduate students, you must be designated as a full-time graduate student by the Faculty of Graduate and Postdoctoral Studies. To be considered for the part-time student assistance program (Part-time OSAP), you must be taking less than 60% of a full course load. For undergraduate students, this means a course load of fewer than 9 credits per term. For graduate students, you must be designated as a part-time graduate student by the Faculty of Graduate and Postdoctoral Affairs. Students with a permanent disability are eligible for both Full-time and Part-time OSAP funding when taking a 40% course load (6 credits per term). The full-time program will provide you with funding for tuition, books and living costs, whereas the part-time program will only provide you with funding for tuition and books. If you are unsure which program is best for you, give us a call. The online OSAP Aid Calculator can provide you with a funding estimate based on a few factors. Submitting an application will provide you with an accurate assessment based on your individual situation. All undergraduate, master’s, and doctoral degree programs at Saint Paul University are approved for OSAP purposes. If you are enrolled as a Special Student, or in a diploma or certificate program, please contact us to determine your eligibility for OSAP funding. If you do not meet Ontario’s residency requirements, you may be eligible for government financial aid through your home province or territory. See below for a list of government financial aid programs by province and territory. The 2018/2019 OSAP application is now open! You can read more details about the changes to OSAP and use the new OSAP Aid Calculator to get an estimate of what you may qualify for. A student may only apply from the province of residence in which he or she has most recently lived for at least 12 consecutive months, excluding time spent as a full-time student at a post-secondary institution. A loan application must be submitted for each academic year you attend. Student loan applications are produced by your provincial loan office and usually become available each year at the end of April. Applications are also available online on your provincial student loan program website, and are typically the preferred method of applying. Paper applications have, in some cases, been eliminated. You may submit a loan application prior to receiving your acceptance letter from Saint Paul University’s admission office. Submit your application as early as possible (before mid-June) to ensure that your loan will be available the first week of classes. Processing times may vary and can take 8 to 10 weeks. You may obtain student loan information from your provincial loan office or by contacting an admissions and student services officer. Private loans may be available through participating financial institutions. Please contact your financial institution for additional details. All students receiving OSAP or other provincial loans are required to adhere to applicable OSAP regulations and conditions, including active participation and satisfactory scholastic progress to the full extent of SPU's satisfactory academic progress requirements. Students will be disqualified from eligibility for OSAP or government loans and withdrawn from loan arrangements if they fail to meet the requirement of full-time status (a course load of 60% or more at the undergraduate level). Graduate students must have full-time status regardless of their course load. Students who are absent for 5 consecutive days of scheduled classes without a valid and documented reason will be withdrawn from their program. Withdrawal from OSAP eligibility is automatic and does not require written notification. Failure to achieve satisfactory scholastic standards during one study period. Student put on probation; student remains eligible for OSAP in next study period. Must succeed in all following academic years to maintain continuous CSL/CSG*/OSL eligibility. Failure to achieve satisfactory scholastic standards during two study periods. Student loses CSL/CSG/OSL eligibility for a minimum of 12 months. Must maintain CSL/CSG/OSL in good standing with lending institution during the 12-month period. Failure to achieve satisfactory scholastic standards during three study periods. Student loses CSL/CSG/OSL eligibility for a minimum of 36 months. Must maintain CSL/CSG/OSL in good standing with lending institution during the 36-month period. Saint Paul University complies fully with the performance requirements for the administration of the Ontario Student Assistance Program (OSAP) by Public Schools as set out by the Ministry of Training, Colleges and Universities (MTCU), to ensure proper administration of public funds and the prevention of program abuse and fraud. If your loan application is not processed by the first day of class, you can complete a Continuation of Interest-Free Status Application for your previous loans. Deadline to submit your OSAP application and supporting documents: deadline dates to submit your OSAP applications and supporting documents depend on the duration of your program (one term or more). You may be required to provide documentation. Please understand that some appeals can take up to 8 weeks to be processed by the Ministry. The appeal deadline is 60 days before the end of your study period. If you have previously received OSAP funding, it is important to remember that if you are registered as a full-time post-secondary school student, interest does not have to be accruing on your loan(s), nor should you enter repayment. To be granted this opportunity, you must take the initiative! To have your loans placed into interest-free status, the National Student Loans Service Centre (NSLSC) and/or bank (for loans before 2001) need to know that you are enrolled and in school full-time. If you have applied for OSAP and your application has processed, an automatic Confirmation of Enrolment process will take care of this for you. In some cases, a Continuation of Interest-Free Status/Confirmation of Enrolment (CIFS) application will need to be submitted. Saint Paul University will use an electronic process to confirm your enrolment to the ministry, which will then inform the NSLSC. If your OSAP application is on hold (e.g., missing documentation), be aware that Saint Paul University cannot automatically confirm your enrolment to the Ministry until it is fully processed. In this case, your previous loans may go into repayment and you will have to start repaying them even if you are in school full-time. To avoid that, submit all necessary documentation and address all outstanding items on your OSAP application OR complete a Continuation of Interest-Free Status/Confirmation of Enrolment (CIFS) application (see below). Once classes begin for your new study period, log into your account at ontario.ca/osap and complete and submit a Continuation of Interest-Free Status application. Saint Paul University will review your application and confirm your enrolment to the Ministry. If the information is complete and valid, the ministry will inform the NSLSC. If you have not notified the National Student Loan Service Centre that you have returned to school as a full-time student before the end of the 6-month grace period, your previous loans will go into repayment. Applications submitted after the end of your study period will not be accepted, and those submitted within the last 13 days of your study period may not be accepted. If you drop below the minimum required course load in a given term, you must complete and submit a new Continuation of Interest-Free Status form for the next term where you are registered full-time; the previous one will be null and void. Remember that you must complete a Continuation of Interest-Free Status application, and submit it before the end of your 6-month grace period to avoid accruing irreversible interest on your previous government student loan. Saint Paul University’s Awards & Financial Aid Office cannot automatically confirm your enrollment with the National Student Loan Service Centre. Loan repayment begins 6 months after the completion of your studies, or when you have stopped being a full-time post-secondary student. Interest accrues on the loan from the time you are no longer a full-time student. The rates and conditions for repayment are set at the time of repayment. It is the borrower's responsibility to understand the terms and conditions of the loans. Specific information is available on each of the provincial loan program websites. For students who temporarily cannot repay their loans due to low income, interest relief and/or debt-reduction programs may be available to aid you in paying the interest on your loans. Applications are available from Admissions and Student Services or from your lender. OSAP Forms can be found on the OSAP website forms section. For more information, contact us by phone at 613-236-1393, ext. 2295, or by e-mail at financialaid@ustpaul.ca.